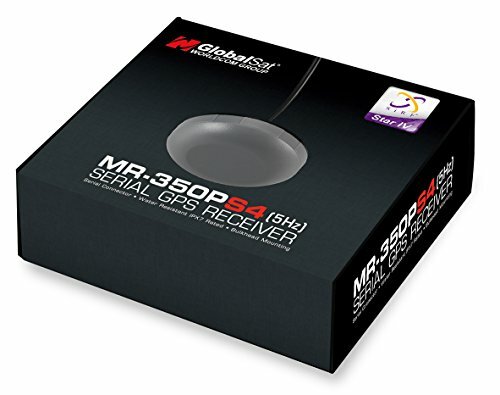 MR-350P-S4-5Hz Bulkhead Mounting is a WAAS enabled Serial GPS receiver that features a highly sensitive, low power consumption chipset in a ultra compact form factor. The MR-350P-S4-5Hz is powered by a SiRF Star IV GPS chipset, and will provide you with superior performance in urban canyons, and in dense foliage. With the SiRF CGEE (Client Generated Extended Ephemeris) technology, has the capability of predicting satellite positions for up to 3 days in advance, and will deliver a CGEE-start time of less than 15 seconds under most conditions without any network assistance. The MR-350P-S4-5Hz's Micro Power mode allows the receiver to stay in a hot start-like condition almost continuously while consuming very little power. Supports NMEA 0183 V3.0 (GGA, GSA, GSV, RMC) The MR-350P-S4-5Hz requires either the USB, or Serial RS232/PS2 cable sets to function (sold separately). The MR-350P-S4-5Hz outputs NMEA data 5 times a second (5Hz). The baud rate is 115200. Compatible with Windows XP, Vista, 7, 8, 8.1, 10, Mac OSX, Linux & Android. Requires NMEA compliant Navigation software (not included). Requires USB Cable Set (BR305-USB8) or RS232 Cable Set (BR305-RS232) to interface to your PC or Mac.